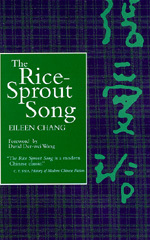 The first of Eileen Chang's novels to be written in English, The Rice-Sprout Song portrays the horror and absurdity that the land-reform movement brings to a southern village in China during the early 1950s. Contrary to the hopes of the peasants in this story, the redistribution of land does not mean an end to hunger. Man-made and natural disasters bring about the threat of famine, while China's involvement in the Korean War further deepens the peasants' misery. Chang's chilling depiction of the peasants' desperate attempts to survive both the impending famine and government abuse makes for spellbinding reading. Her critique of communism rewrites the land-reform discourse at the same time it lays bare the volatile relations between politics and literature. David Der-wei Wang is Professor of Chinese Literature at Columbia University. His current publications include Running Wild: Contemporary Chinese Fiction (1994).